Alex Theoharides (@Minne_Pop) tames his anger just enough to dissect Martell Webster's game-costing play from last night. Last night, the Timberwolves played one of their most important games of the season. At game time, the Wolves record was 16-16, which positioned them in tenth place in the Western Conference (tied with Utah), 1 game out of the eight and final playoff spot. On Sunday night, they defeated the Philadelphia 76ers 92-91 on two foul shots from Kevin Love with .01 seconds remaining in the game. The victory brought them to .500 for the season and cemented them as being on the cusp of the playoffs. It also led yours truly to exclaim via Twitter that it was their best win of the season. However, if the Wolves are going to meet my preseason prediction that they would eke out the 8th seed in the West they needed to end the first half of the season strong against two foes directly above them in the standings. Last night, they played the first of those two foes, the Denver Nuggets, a team with a record of 17-15, who were coming home after losing an overtime shootout to the OKC Thunder, 124 to 118. The game progressed much as most analysts expected. The Wolves came out strong, before slowing down due to fatigue (The Nuggets play the fastest basketball in the NBA, and the Wolves were flying into Denver from the flat lands of Minnesota). Denver, meanwhile, who was playing without three of their best players (Nene, Danilo Gallinari and Rudy Fernandez) played a chippy, up and down game. Ultimately, both teams struggled to pull away in the fourth quarter and the game went to overtime. Neither team scored in the first three minutes of overtime, then Aaron Afflalo hit a running layup and the Nuggets eventually gained a three point advantage. At which point, this happened. Yes, it was one of the most boneheaded plays you’ll ever see on a basketball court. Yes, Martell Webster’s stupid haircut makes him all the more ripe for ridicule. And yes, it may have reduced me to lying in the fetal position (consult Mrs. MinnePop for all the sad details.) But ultimately, it wasn’t that big of a deal. Here’s why. 1) The Wolves deserved to lose the game. They were the better team. In the first half, their starting lineup raced out to a huge advantage, leading 30 - 18 at the end of the first quarter. Then Coach Rick Adelman elected to turn the game over to the bench. 8 minutes later the Twolves were losing. A far bigger takeaway from last night’s loss is the fact that the Wolves bench is terribly thin and inexperienced. Look at the plus/minus index from the game. The only bench player who had a decent game was Derrick Williams, and he only played 22 minutes. Bonehead plays happen, but if the Wolves’ are going to make the playoffs they need their bench to be more productive. In particular, JJ Barea’s impact has been frustrating. He forces too many bad shots, and struggles to score when he is the Wolves’ best offensive player on the floor. He was effective last season for Dallas because of his energy, and because he was surrounded by talented scorers. He’s much less effective when teams can focus their defensive efforts on stopping him. 2) Nikola Pekovic got hurt. Martell Webster never should have been playing in overtime. The Wolves dominated the first quarter, largely due to the herculean (can’t help using this word when it comes to T-Pek) efforts of their starting center, who had 7 points and 7 rebounds in just 15 minutes of run. Then he injured his ankle, forcing Adelman to choose between staying big with Brad Miller at center or going small with Love playing center, Williams playing the four, and Martell playing the three. The Brad Miller experiment proved unsuccessful, so Adelman turned to small ball. For the most part, it worked. 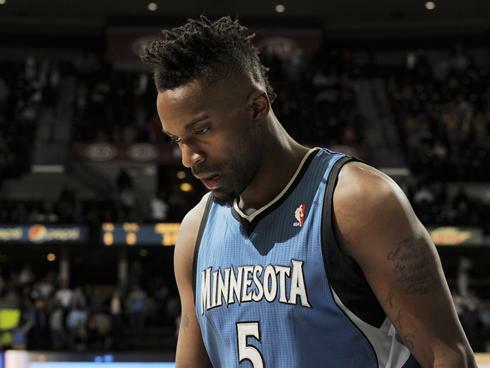 The Wolves fought to tie the game up and send it into overtime, at which point Martell Webster’s brain exploded. 3) Martell’s explanation for why he went for the dunk almost makes sense. After the game, he explained, "I don't know, I don't know if it was a mental thing, like I shot (a three) before that and didn't knock it down," said Webster. "I just wanted to be aggressive, get to the rim, possibly get a foul. But I didn't." Then he added, "Most people probably would have pulled up for the three-point shot. Yeah, I can see why they would. If I had to do it over again, I'd probably pull up for a three. Why not?” Clearly, he was confused by the situation. However, I’d argue that his confusion was at least partially due to the Wolves’ strategy on the previous positions, when they attempted to score quickly and then foul the Nuggets. Clearly, he should have had a better sense of the score (down three) and the amount of time left on the clock (4.9 seconds) when he made a steal of an errant pass. However, the Wolves had no time-outs remaining, there wasn’t enough time for him to find an open teammate, and it’s highly doubtful Webster would have managed to successfully jump stop and rise up for a 3-pointer. After all, he’s only shot 27% on 3-pointers this season, and most of his threes have been open, catch and shoot misses. Driving to the rim, and hoping to score and get fouled is nearly as likely an outcome as expecting Martell Webster to make a jump stop, three pointer. However, facts are facts, and Martell Webster’s hair is ridiculous. The lesson being, if you have a stupid haircut and you make a stupid play, don’t be surprised when people call you stupid.